Savanna grasslands are globally important ecosystems consisting of one of the most extensive grazing lands with unique biodiversity. The objectives of the study were to assess the effect of grazing intensity on grassland ecosystem condition, herbaceous plant biomass production, and nutritional content of selected grass species. The study was conducted at Chagni Ranch, Northwest Ethiopia. Four transects to water source point at regular intervals of 20 m between sampling plots along transects were used for data collection. The distance between the four transects was 200 m in radius. Data were collected on grass composition, basal cover, litter cover, number of seedlings, and age distribution of dominant grasses (i.e., young, medium, or old in terms of stage of maturity), soil condition in terms of soil compaction, and soil erosion linked to the effects of trampling by grazing animals along transects (hereafter referred to as transect) to water source point. The total sample size for grass species was 160 plots. The grassland ecosystem condition, herbaceous biomass, and grass nutritional content were used as response variables linked to transect from water source point. The effects of transect on grassland ecosystem condition scores and grass nutritional content were analyzed using the analysis of variance (ANOVA). Grassland condition factors like grass composition, basal cover, litter cover, age distribution of dominant grasses, and soil condition were significantly (P < 0.05) higher for the furthest transect to water source point than nearest transect. Out of the 28 identified herbaceous species, grasses accounted for 64.3% of the herbaceous community. Within grass species, about 55.6% were highly desirable in terms of palatability and grazing value (as most palatable species are susceptible to heavy grazing intensity). The results showed a significantly (P < 0.05) higher proportion of perennial grasses at the furthest transect to water source point than nearest transect. The dry matter yield at the furthest transect (TD4) and third transect (TD3) were significantly (P < 0.05) higher than the nearest transect to water source point (i.e., the first transect (TD1) and second transect (TD2)). Ash, neutral detergent fiber, acid detergent fiber, and acid detergent lignin contents of Cynodon dactylon, Sporobolus pyramidalis, and Digitaria ternata were significantly (P < 0.05) higher at the furthest transect to water source point than nearest transect. Grazing intensity had no significant effect on the crude protein content of Cynodon dactylon and Sporobolus pyramidalis at different transects. The results showed that the furthest transect to water source point were in good condition. Grass biomass production and the nutritional contents of grasses were higher for the furthest transect to water source point. The results suggested that increased grazing intensity towards water source point greatly reduced the abundance of desirable perennial grasses and the sustainability of grassland for livestock production. Savanna grasslands are globally important ecosystems consisting of one of the most extensive grazing lands with unique biodiversity (Mills et al. 2006). The savannas of Africa are more explained in terms of vegetation ecology with a dominance of grasses with scattered tree life forms (Oba et al. 2000; Angassa 2007). The dynamics of vegetation in African savannas are primarily influenced by climate variability (Angassa 2007; Angassa and Oba 2008). On the other hand, grasslands are the primary sources of native forage and/or habitat for domestic ruminants and varieties of wild animals (Carlier et al. 2009). Human beings generally rely on ecosystem services for their own security (Denbeshu et al. 2018). Thus, savanna grasslands provide many of the important goods and services for human beings including food, timber, fresh water, protection from natural hazards, carbon storage, and many other functions including recreation and tourism (Messerli and Ives 1997). However, grassland ecosystems are increasingly under threat due to the impact of human activities (Denbeshu et al. 2018). Specifically, the rapid growth of human population leads to the expansion of crop cultivation into grasslands. Grazing intensity towards water point source can influence the composition of plant communities (Landsberg et al. 2002). According to Lange (1969), animal congregation and the interface between animals and water source point may lead to heavy grazing. Furthermore, climate change has the potential to alter these ecosystems and the services they provide in terms of ecosystems function and the benefits to human society. In African, savannas are home to different species of flora and fauna (Chape et al. 2005; Newmark 2008), covering about 50% of the continent. Generally, the term savanna grassland encompasses all kinds and types of land that can be grazed by domestic and wild animals (Allen et al. 2010). Savanna grasslands are characterized by multiple functions and values (e.g., forage production for livestock) (Stypinski 2011). Savannas are rich in plant species with diverse classes of plant life forms. The high diversity of plant species as well as other living organisms is considered to be desirable characteristic in many types of grassland ecosystems that can sustain high forage production and quality for livestock production (Habtamu et al. 2013). Livestock grazing plays a major role for the maintenance of ecological diversity (Peris 2004). Grasslands cover a wide range of altitudes and those extensive grasslands are mostly found in the arid and semi-arid zones. In Ethiopia, grasslands provide the major sources of feed for the livestock sector although climate variability and recurrent droughts create forage scarcity (Reid et al. 2005; Angassa and Oba 2008). The domestic livestock population of Ethiopia is the largest in Africa and the 10th in the world with more than 80 million heads (Temesgen et al. 2014). Next to crop production, the livestock sector has a great potential to assist the socio-economic development and transformation of the country (Tadesse and Solomon 2014). However, the low productivity of the livestock sector is one of the biggest challenges in Ethiopia. Low livestock productivity in Ethiopia is attributed to inadequate feed supply and poor condition of the grasslands that might contribute to the low nutritional content of the native forage. Climate change is one of the major drivers altering the precipitation patterns with considerable implication on grassland ecosystem condition and forage productivity. Rainfall variability and limited moisture substantially reduce plant growth and profoundly influence the productivity of grassland and ecosystem services, livestock productivity, and human societies (Paul et al. 2015). Livestock productivity refers to the ability of the animals grown to produce economic outputs such as livestock products and by-products of good quality (meat, milk, animal draft power, manure, hides, skins, and wool), which is largely influenced by the availability of feed resources. The major feed resources in Northwest Ethiopia are natural forage, crop residues, conserved hay from native grasses, stubble grazing, and non-conventional feeds (Solomon et al. 2014). On the other hand, the natural feed sources for livestock in northwestern part of Ethiopia are declining due to the conversion of grazing lands into cultivated lands and increased grazing intensity (Tadesse and Solomon 2014). Inadequate feed supply is one of the major constraints hampering livestock production in Ethiopia (Habtamu et al. 2013). In addition, increased grazing intensity along transect to water source point has had negative impacts on grassland condition in terms of productivity and changes in plant species composition (Galal et al. 2016). Transects to water source point can have a major influence in regulating the distribution of grazing animals in arid and semi-arid rangelands (Harrington 2002; Eldridge and Delgado-Baquerizo 2017). In heavily grazed areas in the nearest transect to water source point, less palatable plant species such as forbs may possibly dominate the grassland community (Angassa 2014). Bedeke and Nigatu (2015) have also shown that the density of bush encroachment is increasing in the vicinity of water source points. Hence, knowledge of the current status of grassland ecosystem condition is relevant in terms of transect to water source point to understand the causes of change in grassland condition and nutritional content of selected grass species. The effects of grazing can cause shifts in plant species composition of the grassland ecosystems ultimately through substantial damage to soil due to the effects of trampling by grazing animals (Solomon et al. 2007; Angassa 2014). Empirical evidence on the condition of grasslands, plant biomass production, and forage quality are key factors determining the grazing capacity of savanna grasslands for sustainable livestock development. Furthermore, to improve the problem of feed scarcity and low productivity of the livestock sector, knowledge of grassland condition, species composition, and nutritional content of major grass species is essential for enhancing productivity. Previous studies (Angassa and Bars 2000; Angassa and Beyene 2003; Angassa et al. 2006; Angassa 2014) have reported the impacts of bush encroachment and altitudinal variation on grassland condition and herbaceous species composition. However, none of these studies have considered the impact of transect at various levels to water source point on grassland ecosystem condition, biomass production, shifts in vegetation composition, and nutritional content of selected grass species. Generally, empirical evidence is lacking regarding the current status of grassland ecosystem condition, biomass production, and nutritional content of selected grass species along transects to water source point in Northwest Ethiopia and, hence, this paper attempts to address these knowledge gaps. Therefore, the objectives of the study were (1) to assess the effects of grazing intensity along transect to water source point on grassland ecosystem condition, (2) to assess the effects of grazing intensity along transect to water source point on grass biomass production, and (3) to evaluate the effects of grazing intensity along transect to water source point on the nutritional content of selected grass species. The study area is located in the northwestern part of the country, approximately 505 km from the capital Addis Ababa (Fig. 1). 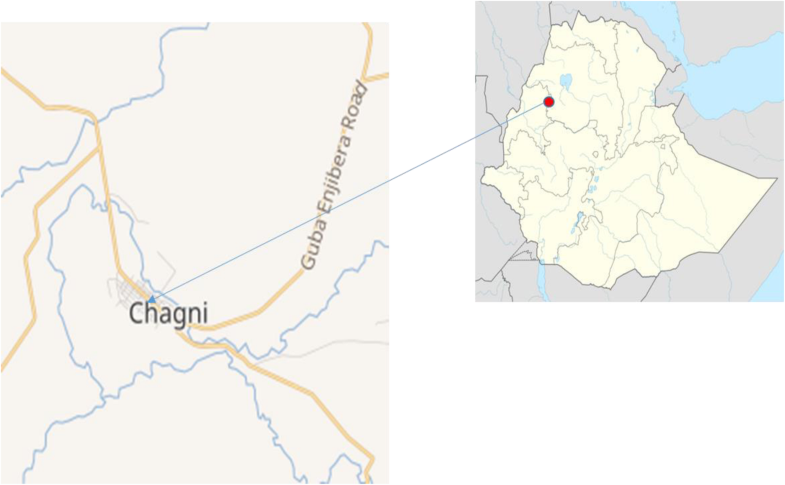 Chagni Ranch is found in Guangua District of Awi Zone in Amhara National Regional State of Ethiopia. The total area of Chagni Ranch is 1367 ha. The elevation of the District is within the range of 1501–2000 m above sea level. The area possesses extensive areas of grassland coverage and Perennial River flows, which is suitable for livestock grazing. Livestock use different water source points along this Perennial River flows within the Ranchi grazing area. The major feed resources for livestock in the study area comprise grasses, shrubs, and tree leaves. According to Melak (2017), lack of proper grazing management, overstocking, and/or heavy grazing are common phenomena in the study area. The climate of the study area is classified as sub-humid, which is characterized by contrasting seasons (i.e., very wet and very dry seasons). Chagni area has a bi-modal distribution of rainfall receiving the highest amount of precipitation between May and October while the short rainy season is between February and April (Menale et al. 2011). The total population of the district is 223,066 (111,172 males and 111,894 females). As to the vegetation of the study area, herbaceous and woody plants are the major vegetation types in the study area. Among the herbaceous species, grasses accounted for 64.3% of the total herbaceous species with 57% of the grass species being highly desirable (palatable) (Melak 2017). According to a study by Melak (2017), Cynodon dactylon, Digitaria ternata, Digitaria velutina, Brachiaria dictyoneura, Commelina genghalensis, and Panicum maximum were the most palatable grass species. The herbaceous plants were classified into grasses, legumes, herbs and sedges. The woody vegetation of Chagni ranch is composed of trees, bushes, and shrubs. The densities of the different woody vegetation types differed from each other. Tree species like Schinus molle, Casuarina equisetifolia, and Eucaulyptus camaldulensis were found at the furthest transect to water source point. The abundances of tree species were zero to seven trees per plot (i.e., 20 × 20 m). The abundances of bush plants were zero to 16 plants per plot (10 × 10 m area of plot on ranch). Historically, the vegetation of the study area was used for communal grazing areas by the local community. Since the last three decades, the ranch area was devoted primarily to the practice of ranching (i.e., the practice of raising grazing cattle for local breed improvement) run by the government under the Ministry of Agriculture. In order to conduct the study, Chagni ranch was divided into four blocks (Table 1). Then, four transects per each block were established radiating away from water source point. Each vegetation density and species composition was sampled in quadrats of different sizes: herb layer—1 m2, shrub layer—25 m2, bush layer—100 m2, and tree layer—400 m2. Data related to the number of plots per each vegetation layer (i.e., herbaceous = 160, shrubs = 128, bush = 112, tree = 80) and the number of plots per a single transect for each vegetation layer (i.e., herbaceous = 10, shrubs = 8, bush = 7, tree = 5) are presented in Table 1. Consequently, herbaceous biomass and species composition were collected from the 160 plots. The experimental design for this research is presented in Table 1 and Fig. 2. 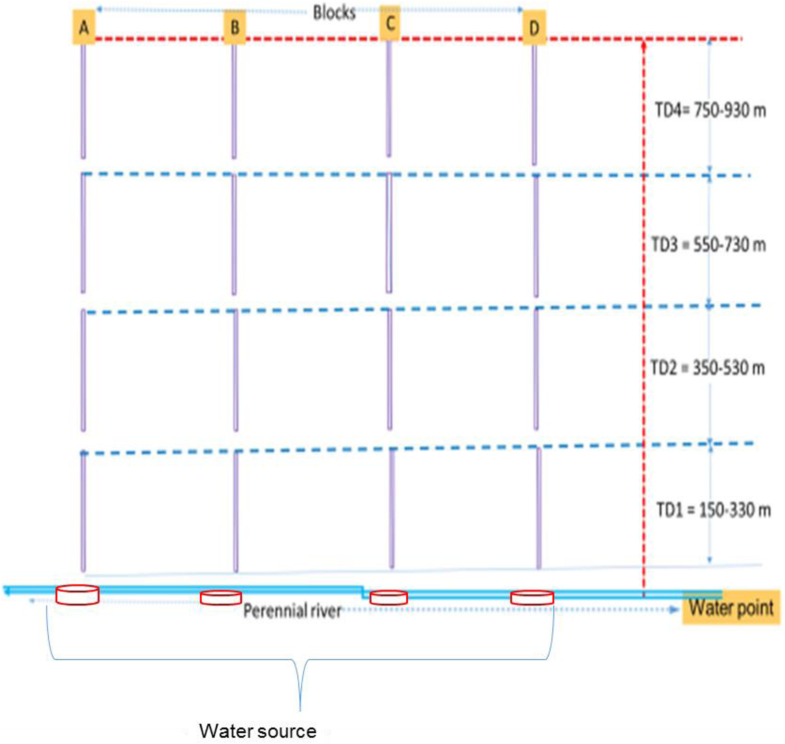 Transect 1 (TD1) was replaced 150–330 m distance from a water source point and hereafter referred to as the nearest transect to a water source point, transect 2 (TD2) was replaced 350–530 m, transect 3 (TD3) was replaced 550–730 m, and transect 4 (TD4) was replaced 750–930 m to a water source point, which is the furthest transect to a water source point. To assess the condition of the grasslands in the study area, we used the following approach (Appendix; Baars et al. 1997). Assessments of range condition scores were based on visual estimation of percentage of decreasers or increasers at each sampling site (Appendix). According to the rangeland succession theory (Dyksterhuis 1949), grasses can be classified into desirable species, likely to decrease with heavy grazing pressure (decreasers); intermediate species, likely to increase with heavy grazing pressure (increasers); and undesirable species, likely to increase or invade with heavy grazing pressure (pioneers). The classification of grasses in the sampled plots was based on information from arid to semi-arid rangelands of southern Africa as shown in Appendix (Ivy 1969; Tainton 1981). The life forms of grasses were assessed with the help of knowledgeable farmers and manuals developed by Fromann and Persson (1974) in terms of annuals (i.e., those grasses that complete their life cycles within 1 year, and then die) and perennials (i.e., those plants that live more than 2 years). The identification of herbaceous plant species was carried out according to the guidelines developed by Fromann and Persson (1974), and by comparison with specimens stored in the national Herbarium Addis Ababa. These were augmented by the opinions of local elders on the palatability of a particular species. Information was gathered from community representatives and key informants (livestock keepers) on vigor and palatability of a particular species. A species with high palatability was considered a decreaser, whereas a species with medium palatability that is not affected by grazing pressure was considered an increaser. Scores were based on visual estimation of percentage of decreasers or increasers at each sampling site (Appendix). A maximum score of 10 points each was given for three of the factors (grass composition, basal cover, and litter cover) and a maximum score of 5 points each for the remaining four factors (number of seedlings, size distribution of selected grass species, soil erosion, and soil compaction), summing to a maximum possible score of 50 points. Hence, five levels of total scores were used and these were interpreted as follows: very poor (≤ 10 score), poor (11–20 score), fair (21–30 score), good (31–40 score), and excellent (41–50 score). Then, to assess the condition of grasslands, we measured the following factors in the field: grass composition (0–10 score), basal cover (0–10 score), and litter cover (0–10 score) (Appendix). Basal cover refers to the proportion of the plant that extends into the soil, and we measure both the green and dead plants from the same year. On the other hand, the detached and dead fallen parts of the plants were considered to be litter. A representative area of 1 m2 was selected at each sampling site for detailed assessments, and the 1 m2 plot was divided into two halves. One half was further divided into quarters, one of which was divided into eighths. All plant basal cover in the selected 1 m2 was uprooted, transferred while kept together, and drawn in the eighth segment to facilitate visual estimations of basal cover of living parts. We assigned the basal plant cover a score based on the relative plant cover of living plants in the field as follows: 0 score for 0%, 1 for < 1%, 2 for 1–3%, 3 for > 3% composed mainly of annuals, 4 for > 3% mainly perennials, 5 for > 6% with bare spots, 6 for > 6% and evenly distributed, 7 for > 9% with occasional bare spots, 8 for > 9% and evenly distributed, 9 for > 12% with slightly bare spots, and 10 for > 12% with no bare spots. Similarly, we assigned the litter plant cover a score based on the relative dead and fallen plant parts in the field as follows: 0 score for < 3%, 2 for 3–10% with weeds or tree leaves, 4 for 3–10% composed mainly of grasses, 6 for 11–40% and unevenly distributed, 8 for 11–40% and evenly distributed, and 10 for > 40% (Baars et al. 1997). The rating for basal cover of tufted species was considered “excellent” when the eighth was completely filled (i.e., 12.5%) and “very poor” when the cover was less than 3%. The rating for litter cover within the same area of 1 m2 was considered “excellent” when the litter cover exceeded 40% and “poor” when less than 10% was covered by litter (Appendix). The number of seedlings at each sampling site was counted using three areas, 10 m apart, equal to the size of an A4 sheet of paper (30 × 21 cm) chosen at random. The sheet was dropped from a height of 2 m above the ground. We assigned the basal plant cover a score based on the relative plant cover of living plants in the field as follows: 0 score for no seedlings in the area outlined by the A4 paper, 1 for one seedling, 2 for two seedlings, 3 for three seedlings, 4 for four seedlings, and 5 for greater than four seedlings (Appendix). Size distribution, which was considered to reflect the stage of maturity of the grass plants, was based on visual observation and estimation of the size of the grass tussocks (i.e., small area of grass that is thicker or longer than the grass growing around it) within the 100 m radius in a circular form surrounded by researchers and observers for this purpose. The presence of small, medium and large grass plants of the dominant species was considered as all size categories, Small- and medium-sized plants were defined as having approximately 20% and 50%, respectively, of the size of large mature grass plants of the dominant species. We assigned the size categories of dominant grass species as follows: 5 score for the presence of all size categories of grasses, 4 score for the presence of small- and medium-sized groups, 3 score only for the presence of large-sized group, 2 score only for the presence of medium-sized groups of grass plants, and 1 score for the presence of small-sized grass plants (Appendix). Soil erosion assessment was based on the amount of pedestals (higher part of soils, held together by plant roots, with eroded soil around the tuft), and in severe cases, the presence of pavements (terraces of flat soil, normally without basal cover, with a line of tufts between pavements) (Appendix). If there was no sign of soil erosion (no soil movement), a maximum score of 5 was given and a minimum score of 0 was given in situations where gully formation was observed due to soil erosion. The occurrence of slight sand mulch, slope-sided pedestals, steep-sided pedestals, and pavements coincided with scores of 4, 3, 2, and 1, respectively. Soil compaction was based on the amount of capping (crust formation). If there was no compaction, a maximum score of 5 was given and the scores decreased with increasing capping of the soil. Scores of 4, 3, 2, and 1 were given for soils with isolated capping, > 50% capping, > 75% capping, and almost 100% capping, respectively (Appendix). Selected grass species samples were oven dried at 105 °C for 24 h to determine the dry weight of the samples. The nitrogen (N) content was analyzed using the micro-Kjeldhal procedure and the crude protein (%CP) was calculated as N x 6.25. The neutral detergent fiber (%NDF), acid detergent fiber (%ADF), and acid detergent lignin (%ADL) were determined according to the method described by Van Soest and Robertson (1985). Grass composition (GC), basal cover (BC), litter cover (LC), age distribution of dominant grasses (AD) based on three age categories (young, medium age, and old grasses), numbers of grass seedlings (NS), soil conditions (SC) in terms of effect of erosion and compaction due to trampling effect from livestock grazing, and herbaceous species biomass were considered as numerical response variables against the transect to water source point. The data were checked for normality. Then, analysis of variance (ANOVA) was carried out to analyze the data using the general linear models (GLM) procedure of Statistical Package for Social Sciences (SPSS version 16.0) program. The model included sites/blocks and transect to water source point in a 4 × 4 factorial arrangement. Post-hoc test was employed to compare the mean differences. Statistical significance was set at P ≤ 0.05. The effect of grazing intensity along transect to water source point on range condition parameters is presented in Table 2. The range condition scores for grass composition (GC) at the furthest transect (TD4 and TD3) to a water source point were significantly (P < 0.05) higher than the range condition scores for the nearest transect (TD1 and TD2). Generally, the nearest transect (TD1) had low grass species composition as compared to the rest three transects to a water source point. Grass basal cover (BC) had a significantly (P < 0.05) higher range condition score at the furthest transect (TD4) to a water source point than at the other three transects (i.e., TD1, TD2, and TD3) (Table 2). For example, BC had on average 1 score more in TD3 and TD4 than in TD1. The nearest transect (TD1) to a water source point had a significantly (P < 0.05) lower litter cover (LC) score than the other three transects (i.e., TD2, TD3, and TD4). Overall, higher range condition score values were recorded for grass composition, basal cover, litter cover, and age distribution of dominant grasses at the furthest transect (TD3 and TD4) to a water source point than the nearest transect (TD1 and TD2). The range condition score for the number of seedlings did not show any significant (P > 0.05) difference among the four transects to a water source point. The range condition score for soil erosion was significantly (P < 0.05) higher for the nearest transect (TD1), i.e., with the lowest score of range condition. SE had on average 1.4 score more in TD3 and TD4 than in TD1 with increased soil erosion in TD1 (i.e., nearest to water source point). Soil erosion and compaction were significantly (P < 0.05) higher for the nearest transect (TD1) to water source point than those for the second transect (TD2). The results for soil erosion and compaction also showed a significantly (P < 0.05) higher range condition score for TD2 than those for TD3 and TD4. The present results showed a significantly (P < 0.05) higher range condition score for TD1 in terms of soil compaction. The overall range condition scores for TD1 (26.16) and TD2 (29.02) were in fair conditions. The overall range condition scores for TD3 (31.47) and TD4 (32.74) were in good conditions, and these results were significantly (P < 0.05) higher than the scores for TD1 and TD2. The total dry matter (biomass) production of all herbaceous samples and that of grasses were significantly (P < 0.05) higher for TD3 and TD4 (Table 3). Similarly, the DM of highly desirable grass species for TD3 and TD4 were significantly (P < 0.05) higher than those for TD1 and TD2. The DM production of desirable legume species for TD1 was the lowest (Table 3). There were significant differences (P < 0.05) among the different transects in terms of the less desirable legume species (Table 4). There were also significance differences (P < 0.05) among all transects in terms of desirable herb species (Table 4). The total biomass production of herbaceous species was increased from 141.43 to 169.54 g m−2 as the range condition was increased from fair condition in the nearest transect to a good condition at the furthest transect to a water source point with reduced grazing intensity (Table 4). The total dry matter production of herbaceous samples were significantly (P < 0.05) higher for TD3 and TD4. Dry matter is a measurement of the aboveground biomass of grass samples after completely oven dried at a constant temperature under laboratory condition (Van Soest and Robertson 1985). Similarly, the DM content of four major grass species such as Cynodon dactylon, Sporobolus pyramidalis, Setaria verticillata, and Digitaria ternata were significantly (P < 0.05) higher for the furthest transects (TD3 and TD4) than those for the nearest transects (TD1 and TD2) to water source point (Table 5). The ash content of major grass species in the study area was also significantly (P < 0.05) higher for the furthest transects (TD3 and TD4) than that in the nearest transects (TD1 and TD2) to a water source point (Table 5). The proportion of NDF, ADF, and ADL in grasses were significantly (P < 0.05) higher for the furthest transects (TD3 and TD4) than those for the nearest transects to water source point. However, Sporobolus pyramidalis was exceptional in terms of ADL where it did not show any significant difference (P > 0.05) among the different transects. The percentage of crude protein (CP) in Cynodon dactylon and Sporobolus pyramidalis did not show any significant (P > 0.05) difference among all the four transects in the study area. However, the CP content of Setaria verticillata and Digitaria ternata was significantly (P < 0.05) lower for the furthest transect (TD4) than the nearest transect (TD1) to water source point (Table 5). From the results, key findings emerge in terms of increased grazing intensity towards water source point that might have had a considerable effect on grass basal cover, litter cover, and grass community composition. This suggests that grazing intensity can directly or indirectly contribute to the reduction in the proportion of desirable (highly palatable) grass species while increasing the proportion of grazing-tolerant species (increasers and invaders). We showed that the most palatable grass species (i.e., decreasers) are declining from the plant community composition due to the impact of grazing intensity nearest to a water source point. Our findings link well with previous studies (Solomon et al. 2007; Shahriary et al. 2012; Angassa 2014) wherein grass species composition was affected considerably by livestock grazing in southern Ethiopia and elsewhere (Landsberg et al. 2002) along transects to water source point. Another promising finding was that grazing intensity negatively affected the age/size distribution of dominant grasses along transects to water source points. This implies that grassland sites nearest to a water source point are associated with high concentration of livestock grazing and subsequent trampling that could cause considerable damage on the age class distribution of grasses. Others (Landsberg et al. 2002; Angassa et al. 2010; Angassa 2014) have shown that increased grazing intensity and trampling effect in the vicinity of water source point can affect soil stability and vegetation condition, often leading to substantial reductions in ecosystem services and functions. A similar conclusion was reached by previous studies (Shahriary et al. 2012; Eldridge and Whitford 2009), suggesting that more soil disturbance can occur due to the effects of trampling and year-round grazing in the vicinity of water source point. The furthest grassland sites (TD4) to water source point accumulate more biomass production of herbaceous vegetation than the nearest grassland sites (TD2 and TD1). This is important because heavy grazing intensity and soil disturbance in the vicinity of water source point can cause greater damage on herbaceous plant communities and reduction in yield. It is interesting to note that annual plants dominate grassland sites nearest to a water source point, whereas the distribution and abundance of annual plants decrease with reduced grazing intensity at the furthest transect to a water source point. Similarly, Canan et al. (2011) have reported a significant change in the botanical composition of vegetation in the vicinity of water source point with increased grazing intensity. Overall, most of the herbaceous species listed in Table 3 produced less than 1 g/m2 most likely due to the influence of year-round grazing in the studied ranch area. The findings indicate that the herbaceous biomass production around water source point in Chagni ranch is very low perhaps due to the high concentration of livestock and frequent grazing nearest to a water source point. According to Abate et al. (2012), heavy grazing intensity leads to grassland deterioration and reduction in biomass production. The total dry matter production for the nearby transect to a water source point is significantly lower with fair grassland condition. In contrast, the furthest transects to a water source point were in good grassland condition with more biomass production. This is in line with the reports by others (Mengistu et al. 2015; Solomon et al. 2007; Todd 2006), suggesting that heavy and continuous grazing can cause a reduction in herbaceous biomass. The current findings are also supported by others results (Asheber et al. 2010; Todd 2006; Martin 2006), suggesting that annual herbs and less desirable herbaceous species can tolerate heavy grazing and disturbances nearest to water source point, while desirable grass species dominant at the furthest grassland sites to water source point. The nutritional contents of four selected grass species were analyzed (Table 5). The furthest transects (TD3 and TD4) to water source point produced more accumulation of total dry matter production of herbaceous plants than the nearest transects. We speculate that this might be due to the effect of increased grazing intensity (Angassa et al. 2010; Emmanuel et al. 2012) in the vicinity of water source points. Similarly, the DM production of four selected grass species, namely Cynodon dactylon, Sporobolus pyramidalis, Setaria verticillata, and Digitaria ternata were significantly higher at the furthest transects to a water source point than the nearest transects. This might be due to differences in the intensity of grazing along a transect to a water source point. The low ash composition of major grass species in the nearest transects (TD1 and TD2) to a water source point might suggest excessive deterioration of grassland condition and susceptibility of the soil to erosion. Our results demonstrate that the proportions of NDF, ADF, and ADL in the study area were higher at the furthest transects to a water source point than those at the nearest transects. This is most likely as a result of more accumulation of old and mature grasses in areas of low grazing intensity, i.e., at the furthest transects to a water source point (Allen et al. 2006). Generally, the furthest transects to a water source point are under low grazing intensity as compared to the nearest transects, which enhances more accumulation of fiber contents (NDF, ADF, and ADL) with old and underutilized forage plants. The current findings are consistent with the findings of Habtamu et al. (2013) who suggest that the fiber constituents of herbaceous forage species increase as the stage of maturity of the forage plant advances. One promising finding was that the crude protein content of Cynodon dactylon and Sporobolus pyramidalis did not show any significant differences among transects in the present study. This might be due to the effect of continuous grazing where the rejuvenation of new grasses at the nearest transect contributes to high crude protein content (Bilatu et al. 2013; Abdel et al. 2013). A similar study by Mengistu et al. (2015) indicates that herbaceous species in the open-grazed areas have high crude protein content than those in the rangeland areas that are protected from moderate grazing. We assessed the effects of grazing intensity along transects to water source point on grassland ecosystem condition, grass biomass, and nutritional content of selected grass species. The analysis leads to the conclusion that the furthest transects to water source point were in good condition, whereas the nearest transects to water source point were in fair condition. As we argued elsewhere, increased grazing intensity towards water source point may be considered a major factor affecting desirable perennial grasses and sustainable livestock production. Nevertheless, we found more accumulation of herbaceous annuals in the vicinity of water source point with increased grazing intensity. Overall, our results demonstrate a strong influence of grazing intensity on dry matter production of herbaceous plants. We have shown that grazing intensity strongly influenced the nutritional contents (NDF, ADF, and ADL) of selected grass species with the exception of Sporobolus pyramidalis. Our results suggest that grazing intensity to water source point did not have any significant effect on the proportions (%) of CP of Cynodon dactylon and Sporobolus pyramidalis. However, grazing intensity to water source point had a significant effect on %CP of Setaria verticillata and Digitaria ternata that might strongly influence livestock productivity. We suggest that future research should consider the potential effects of grazing intensity on plant species composition more carefully and its influence on sustainable livestock production. The authors gratefully acknowledge the financial support received from the Federal Democratic Republic of Ethiopian, Ministry of Education for the research work. The authors further thank Mr. Bedru Roba from Adami-Tulu Research Center for his help in the identification of herbaceous species in the field and School of Animal and Range Sciences of Hawassa University for the analysis of nutritional content of grass samples. The authors also recognize the cooperation of Chagni cattle breed and conservation Ranch during the research work. This research work was funded by the Federal Democratic Republic of Ethiopian, Ministry of Education. Funding bodies have no role in the design of the study and data collection, analysis, and interpretation of data and writing of the manuscript. Data for this manuscript was collected through field vegetation sampling and observation in the field. YM conducted the field research, analyzed the data, and drafted the manuscript. AAn and AAb initiated the idea of the research, designed and interpreted the results, and fully participated in the whole process of the write-up of the manuscript. All authors revised the manuscript and read and approved the final version. Yaregal Melak is an MSc student at Hawassa University. His research interest includes rangeland condition, plant species composition and nutritional content of forage plants. Hawassa University, College of Agriculture, Department of Animal and Range Sciences P.O.Box 05, Hawassa, Ethiopia. Ayana Angassa is a Rangeland Ecologists at Botswana University of Agriculture and Natural Resources. His research interest includes influence of grazing and climate on grassland ecosystems, carbon sequestration, indigenous knowledge, invasive plant species, and sustainable management and conservation of natural resources. Private Bag 0027, Sebele, Gaborone, Botswana. Aster Abebe is an Animal Nutritionist at Hawassa University. Her research interest includes the nutritional content of forage plants, grazing effects, indigenous knowledge, invasive plant species, and sustainable management and conservation of natural resources. Denbeshu D, Angassa A, Abebe A, Burka A and Tolera A. (2018) Human-climate induced drivers of mountain grassland over the last 40 years in Sidama, Ethiopia: perceptions versus empirical evidence. Ecol Processes 7:34 https://doi.org/10.1186/s13717-018-0145-5.